On Monday and Tuesday we did something that we talk about a lot, but all too rarely pull off: a couple of "pre-mortems." When we POST-mortem a game, we take a fresh-from-the printer copy, open it up, and go through it piece by piece, talking about how it could have been better. The post-mortem copy gets marked up and goes into the file, and if (when!!?) there's a second printing, we drag it out and ask ourselves how many of these changes we should really make. We don't post-mortem as often as we ought to, and not nearly as often as we did 15 or 20 years ago, but it's a thing. A PRE-mortem is different, and just what it sounds like. Instead of post, it's PRE. When the game is about to go to press, we sit down and look at it piece by piece in the most critical way we can imagine. That can be both difficult and painful for the people who have been working on it all along, but it's worthwhile. 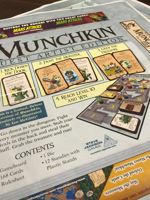 Monday we did a pre-mortem of Ian McGinty's Guest Artist edition of Munchkin. What did we find that was wrong? Not a lot. What did we find that could be improved? Lots of little things! Some card text was reformatted to allow more art space. Some coloring was changed to better show off Ian's original line work. We spotted a rule that could be clarified – yes, rule tweaks still happen, and this one, relating to standies, will carry over into all future printings of Deluxe sets. And we decided that the artist's signature, which was already being used as the icon on this set, would become a standard graphic element on all the Guest Artist covers. 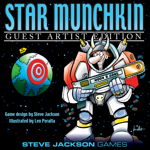 Tuesday we pre-mortemed Len's Star Munchkin – you read the interview with Len on Tuesday. 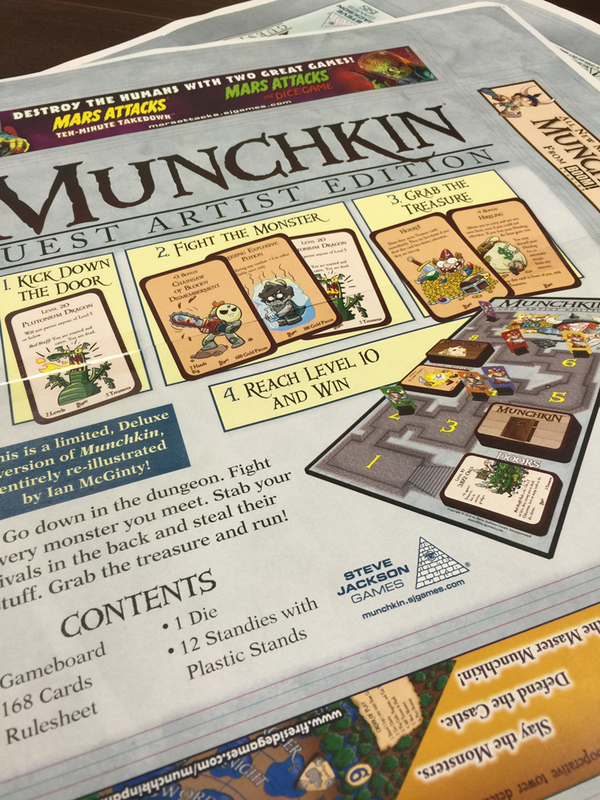 There were fewer changes to make, because the Production team had spent the morning going "If they changed xyz on Munchkin, they're going to change it on Star Munchkin too." (Good for them! – sometimes we forget to tell them when fixes should propagate through multiple sets, but they're getting better at reading our minds.) But we did go in and change the setting on the cover from "Lots Of Stupid Jokes" to "Great Huge Increased Lots Of Stupid Jokes." That poor planet . . . The pre-mortem is a lot of work, and it makes scheduling more complicated. But it brings you a better game, especially when it's the first of a series of REDACTED. Maybe only slightly better. But if we can catch something horrendous, or even aggravating, before it happens: Big Win. And if we can spot problems that carry over to future games and fix them before the last minute, Even Bigger Win. So I hope we can manage to keep this up.